I had bought with me to Italy high expectations of Bologna but I am sorry to say that on balance I was disappointed and was happy to leave. After a final futile search for the lost credit card we made our final packing adjustments and closed the door on the apartment where we had lived for three days. Odd that, that you can live in a place for three days or three years or three decades and then close the door and just leave. All you leave behind are memories, or perhaps a misplaced credit card. We walked to the railway station of course and found it curiously calm. We purchased our tickets and with forty unexpected minutes to spare found a café in the sunshine for a coffee before returning to the station in good time for our train which rather unusually turned up just a few minutes late. I didn’t look back as we left Bologna (the sixth most visited city in Italy) and just a few miles out of the city the scenery improved and happily became more picturesque. To the south were the blue misty Apennine Mountains shrouded still in early morning fog and to the north the fertile plain of the Po Valley, in late September the rich colours of harvest and autumn, umber, terracotta and gold. The train picked up speed and began to hum and predictably Kim fell asleep. 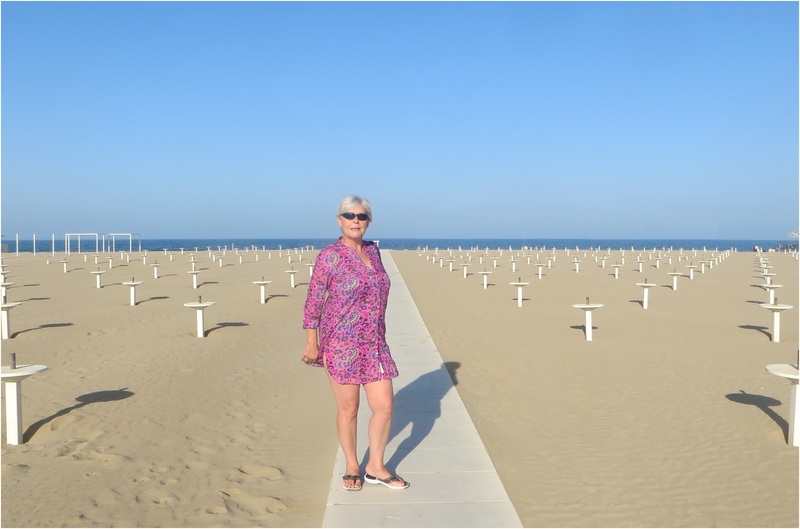 An hour so later we arrived in Rimini and stepped out of the railway station into streets bathed in a glorious golden glow of late morning sun, we ignored the line of taxis of course and set out to walk the mile or so to our hotel on the beach-front strip. I have to say that didn’t have high expectations of the Hotel Diplomat Palace on account of how cheap it was at only €40 a night bed and breakfast but the lobby was well-appointed and the reception desk was efficient and welcoming and we were allocated our room on the fifth floor. What a result that turned out to be as we had a top floor room with an uninterrupted sea view looking out over the beach and we congratulated ourselves on our very good fortune. In late September the holiday visitor season was over, everything on the beach was being dismantled and stored safely away until the following year and the view from our balcony provided a panoramic scene of ten miles of sandy beach stretching in both directions to the north and the south. With the accommodation approved we returned to the streets to take a walk along the promenade and to assess suitable dining options for later. We actually walked further than we originally intended until we reached the swanky marina and could walk no further north so we turned inland and continued to walk to the city centre along the Porto Canale through the fishing port area of Rimini. From here approximately one hundred boats operate daily and although it was well into the afternoon there was still some busy trading activity taking place. Eventually the Porto Canale came to a dead-end so this is where we agreed that we should find a route back to the hotel but we had unexpectedly found ourselves in the trendy district of Borgo San Giuliano, originally a poor fishermen’s settlement but now a charming neighbourhood of small cobbled streets, trendy piazzas, and colourful street murals. This is now one of the most picturesque places in the city and one of Rimini’s most popular areas, with narrow streets and squares, colourful small houses and many frescoes representing characters and locations of Federico Fellini’s films. The neighbourhood is closely linked to the famous Rimini filmmaker who despite being born and raised on the opposite side of the city is said had a special affection for the Borgo. In 1994, the Festa del Borgo was officially dedicated to him and many of the most striking murals lining the walls of the buildings depict scenes and characters from his films. The district was once a lot bigger but it a lot of it was demolished during the frenzy of the Fascist redevelopment period of the 1930s and it suffered more damage in World-War-Two. On account of that it didn’t take a great deal of time to walk around and soon we were plotting a route home with only an inadequate tourist map to assist us. 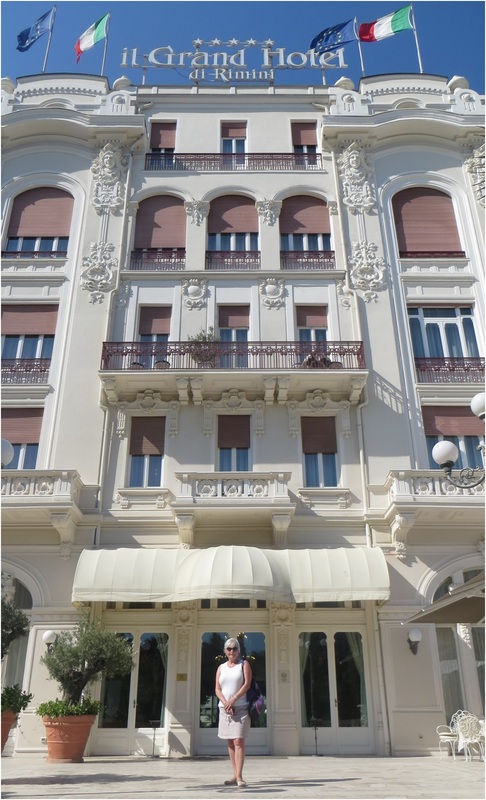 After several interpretations we eventually arrived back at the coast somewhere close to the Rimini Grand Hotel, an elegant building of shining white stucco and Art Nouveau decoration. This wasn’t where we were staying of course but I checked later and although it looks like a hotel for the travelling elite it was surprisingly inexpensive. Fellini liked the Grand Hotel and he kept a suite there permanently reserved for himself. We made our way back to the much more modest Diplomat Palace, sat on the balcony for a while and then went to the beach and had a swim in the sea and collected some driftwood to take back home to reboot the boat building hobby. Later we dined at a simple restaurant and declared ourselves satisfied that we had changed our plans and arrived a day early. We liked Rimini. We had walked seven miles today. 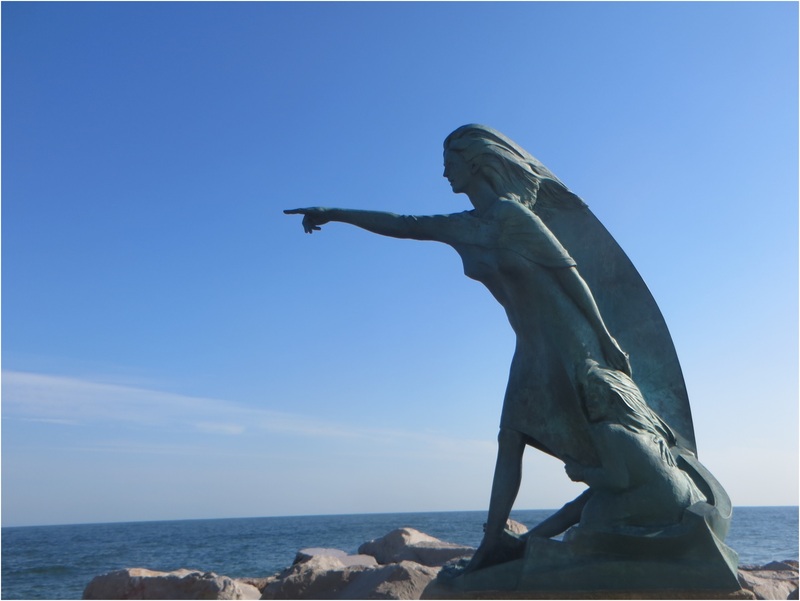 This entry was posted in Beaches, Cathedrals, Childhood, Europe, Food, History, Hotels, Literature, Postcards, Travel, World Heritage and tagged Adriatic Coast, Bologna, Culture, Italy Tourism, Italy Trains, Life, Rimini Italy. Bookmark the permalink. I agree that cutting your losses and moving on was the right thing to do. We’ve learned, as we’ve gotten older, that our time is worth more than the dollars we’d lose leaving a place early. And it turned out to be a really good decision. I liked Bologna but not as much as I thought I would! Almost makes me want to visit. An amazing transformation takes place that’s for sure! What a place this must have been before it was targeted by tourists. That Borgo San Giuliano area looks great! I have some pictures coming up soon! Yippee! 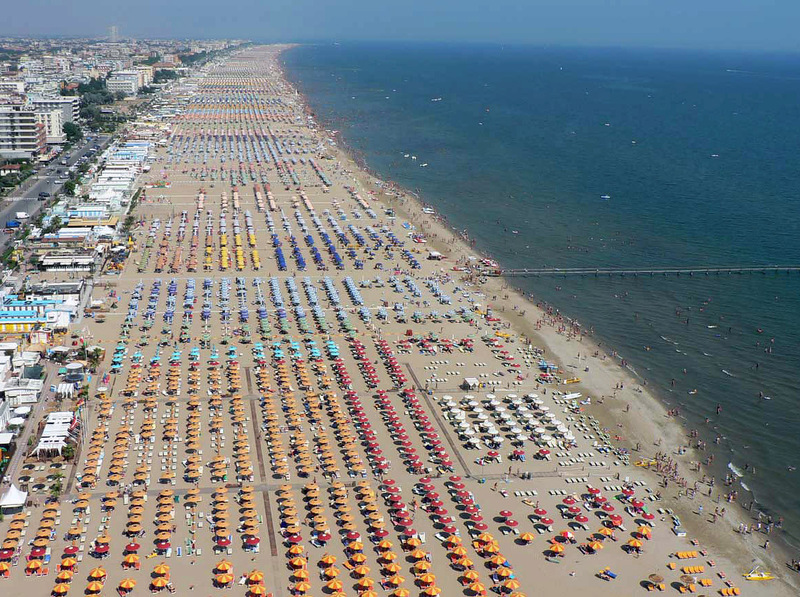 You might have me wanting to do a trip to Rimini! I agree with you about the beach Curt but in a way I was disappointed, it is sort of iconic in Italy/Europe to have a well managed beach like that! It is a long time since I did any serious beach work Curt but I do enjoy a walk along the sand and a swim in the sea. We live about 5 miles from the sea, nearby there are a lot of seals but no pelicans. We’re only about 3 miles from the ocean, (Curt, I think is a whole lot farther inland), but to be honest we don’t see many pelicans on this stretch of the coast. Quite a few seals or sea lions, though. Whales 🐳, too! I have opposite views. I love Bologna, having been there many times, but thought Rimini was extremely ordinary. I found Bologna to be a bit grubby. I think it was the people in Rimini that made the difference, I found the place very friendly. I like the look of Rimini too (off-peak version). A good Spring or Autumn option. It seems a good trip to Rimini. I llike the look of the Grand Hotel too. It looks very old but styles. Perhaps you could send them the picture of the beach at Rimini. 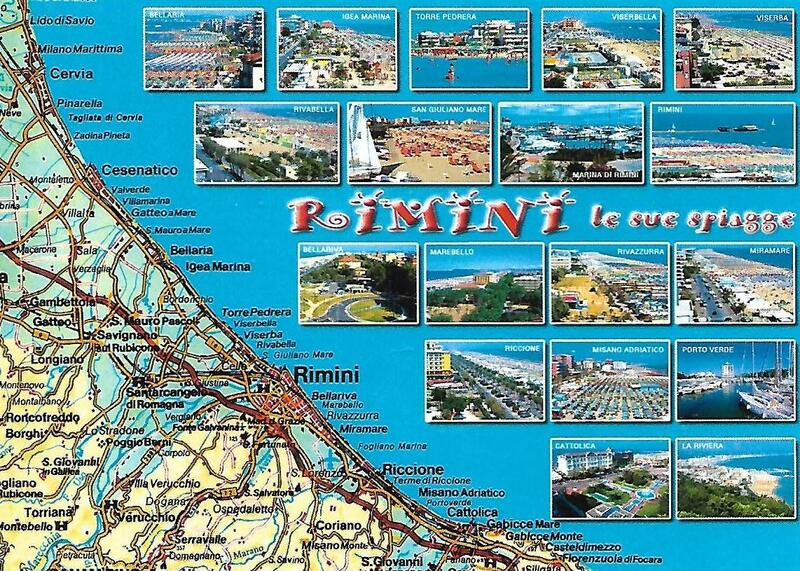 I like Skegness but I prefer Rimini. I doubt beach furniture would last a full season in Skegness!